Let's talk about collaboration, which if you're looking to crossover in mainstream radio these days, it's kind of essential. Now this to some extent has always been true when it comes to pop music - especially in hip-hop with the omnipresent featuring credit - but when you consider how many of the acts in the top ten right now are group acts where cohesion becomes a question? Well, I can tell you: as of now, you're looking at 7/10 of them, and that's ignoring the Stormzy remix of 'Shape Of You' while counting that Kendrick remix of 'Mask Off' that really makes the song work, for me at least. And while I've been quick to highlight how these collaborations have paid stunning dividends for a DJ like Calvin Harris... let's get the real, the act that has always stood as marketer and hype man over producer has always been DJ Khaled, who with two singles in the top five right now is pretty much at the top of his fame, and with the release of the album probably will have a shot at sending one to #1, despite only producing just over half the song on said album. An album, which at last count, has over thirty collaborating artists and stretches nearly ninety minutes. Now the problem with overloaded and overlong collaboration records is that there is nearly always bloat and just not enough high points to obscure gaping flaws - it was one of the biggest problems with Major Key last year, and if anything I expected it to get worse without any Kendrick Lamar verse to save any songs. But with all of that... what did we get from Grateful? Okay, this was a pretty odd listen, to the point where the first records that came to mind after getting through this double album was The Documentary 2 and 2.5. Now granted it's not as good as either of those records, but it oddly seems to have a similar arc: a first disc that's brighter, flashier, more commercially accessible, and then a second disc that definitely hits greater highs, but also deeper lows, and pretty much sounds like nothing on the first disc in terms of style and production. It's also the point where DJ Khaled didn't provide as much of his own production... and you can definitely tell, because it's a lot less cohesive and has a pretty inexcusable lowpoint after 'Billy Ocean' that only serves to emphasize this project was too long and too sloppy to earn that length. 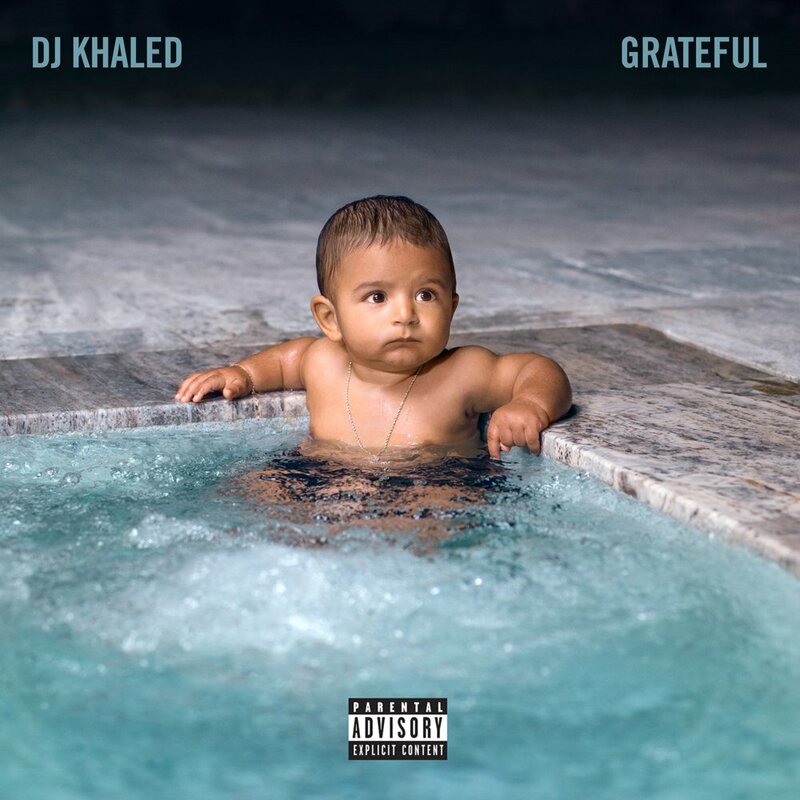 And here's the thing: DJ Khaled is not an 'album' artist, and while he tries to string together some tangential connection to his infant son across this entire album - culminating in the most kid-friendly hip-hop song since the Fresh Prince on 'I Love You So Much' with Chance The Rapper that features both reciting the alphabet and identifying parts of one's face - deep down Khaled is here to curate a selection of singles and collaborations, and they really are only as good as the artists behind them. Hell, the songs where there's really only one artist feel a little out of place - I've already talked on Billboard BREAKDOWN how 'To The Max' just doesn't do much for me, especially as Drake seems tuned out, but then you have reggae artist Sizzla trying and failing to sing through the autotune on 'I'm So Grateful' - not a good way to start the album' and then Mavado crooning his way through another closing track that just falls incredibly flat. Hell, go to 'Major Bag Alert' by Migos and it effectively sounds like a pretty decent Migos song, especially as DJ Khaled didn't even produce it! The one quasi-solo song I liked was the 'Interlude' from Belly, mostly because his verse was a little more colorful against a pretty likable glossy beat - although that abortion line felt weird and I think even he knows it - but again, Khaled didn't produce this either, so is it really only here because of how Belly praised him, and if so, it doesn't help how egocentric and bloated this feels! But okay, you're here for the collaborations that are distinct or interesting, and there are definitely a few of them. I already talked about 'Wild Thoughts' is a pretty terrific pop song just yesterday through the reuse of that 'Maria Maria' sample, but there are some pretty terrific samples across this project that form the backbone of good collaborations, like between Nicki Minaj and Alicia Keys on 'Nobody' with the gospel swell, thicker drums and bass, or the rich glossy piano and synth sample from Jay-Z behind 'Billy Ocean' that pairs Fat Joe and Raekwon and it's slick as hell, or especially the soul sample behind 'Good Man' which pairs up Jadakiss with Pusha T and it's easily the best song here in terms of bars, punchlines, and content. On the flip side you have 'Pull A Caper', which features a minor-shifted sample of Phil Collins' 'Against All Odds' behind a hook from Kodak Black and a really thin oscillating synth that set my teeth on edge that Rick Ross couldn't even save. And that's something that needs to be noted, because there are a couple guest stars that show up multiple times that work for DJ Khaled - Ross is one of them, mostly because his brand of decadence fits well against Khaled's style of production - and then there are those who don't, and unfortunately Travis Scott is one of them. He also shows up four times and frankly he's only passable on 'Don't Quit', which is effectively a modern Calvin Harris reject - sadly, his brand of autotuned singing and not particularly interesting content just doesn't mesh well with Khaled - and neither does Future for the record, who shows up five times, all on the second disc, and he's either oversinging or on 'Iced Out My Arms' completely checked out, with probably the worst moment coming in his collaboration with Young Thug on 'Whatever', which is only barely saved by a mostly amusing 2 Chainz verse. And that should be pointed out as well - there's no song as atrocious on this project as 'Pick These Hoes Apart' on Major Key, but that's more because of hail mary verses from MCs who just save this from being awful, which is most blatant on 'Iced Out My Arms' when T.I. of all people goes opposite this utterly flat production from Metro Boomin, a horrible hook from Future, and only so-so verses from Migos and 21 Savage and actually showcases a way to deliver a mumble rap flow and delivery with actual charisma! Similar case for the big single 'I'm The One', where Chance and Quavo basically the song from Lil Wayne just completely going offscript in the worst way possible, or when Nicki shows up on 'I Can't Even Lie' to save a pretty bad Future song from itself - seriously, when even Future is trying to come up with excuses for his own incoherence, he's delivering a bad set of performances. But that's the thing: there are not many artists that sound comfortable over Khaled's brand of too-slick, slightly pop or gospel-inspired opulence - Ross sounds fine over it, as does Nicki Minaj and pretty much most of the old-school MCs that are less dependent on Autotune, and nowhere is that contrast most apparent than on 'It's Secured', where you have Travis Scott on the hook opposite two verses from Nas. And yeah, they're good because it's Nas and he can knock out this more conscious slice of brag rap in his sleep, but incidentally it's probably not a good thing you called back to 'Nas Album Done' last year and that record still isn't out yet! But Nas' presence also highlights a change in focus, because this is a lighter, less overtly-lyrical record than Major Key was with its verses from Kendrick and J.Cole and Busta Rhymes - which has to be the reason he tacked on these mostly generic trap bangers to the second disc that he didn't even produce and don't fit at all with his style! But I guess we can't assign too much blame to DJ Khaled for this - after all, the album's executive producer was his infant son, who according to Khaled was responsible for picking each song and vibe and apparently if he pooped or threw up, those were 'super blessings'. And while there's a very big part of me that feels like Khaled's whole act is an extended performance art piece that the mainstream public needs to get sick of a hell of a lot faster, he makes it very clear his loves his son and will probably turn him into the most spoiled child alive. But in a twisted way it does allow this album to make a certain amount of sense, designed by a baby that doesn't have a defined sense of object permanence yet into a bloated, indulgent mess. I'm not denying that there aren't a few good songs or verses, but is it worth the surrounding 80+ minutes of mediocre to just flat-out bad music to get there? In my opinion, this is a light 5/10 and only really recommended if you've bought into Khaled's lifestyle. Otherwise, check the singles, pick up 'Good Man' and maybe 'Billy Ocean' and 'Nobody', and skip the rest - trust me on that.